If you've seen my posts before you know that I can't help but talk about bargain carpet cleaners in Tampa FL. I see these signs in the median and at intersections all over town. 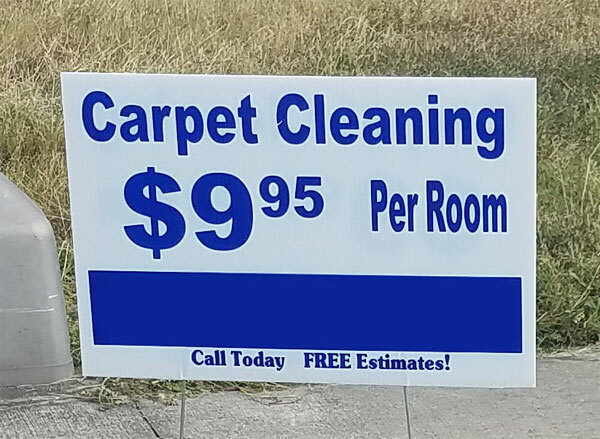 Every time see one I have to laugh a little because I know the true cost of carpet cleaning and I can tell you that a bargain carpet cleaner is not interested in cleaning carpet for $9.95 a room. At $9.95 a room a carpet cleaner is not making enough money to use cleaning solution to clean carpets. In other words they are just going to use hot water at high pressure to clean your carpet. This is only after they try to convince you to pay a higher price for pre-conditioning the carpet or tell you that your carpet is too soiled for the $9.95 rate. This sign is 100% bait and switch. They are trying to grab you with and extremely low price to get in your front door. As a professional carpet cleaner in Tampa FL I can tell you that the prices in carpet cleaning directly reflect the quality of cleaning you get. The cheaper the price the less effective the carpet cleaning will be. My recommendation is to expect to pay between $35-$50 a room for a proper carpet cleaning. Anything less is not going to be effective. I know this sounds self serving but it simple the less you spend on your carpet cleaning translates to a carpet cleaner that has less money to put toward cleaning solutions and equipment. I'm not saying you should pay a lot for carpet cleaning either, but do your research before inviting a carpet cleaner into your home. For a quality carpet cleaner in Tampa FL call Chem-Dry of Tampa.